This article appeared in the A Section of the Washington Post on February 15, 2018. We are proud of our client Cathy, who told her very personal story to Post reporter Caitlin Dewey. Even though she has an associates degree and a good full-time job, she is supporting five young children on her own, and struggles to make ends meet in our expensive area. Federal safety-net programs that are being considered for cuts in the President's FY2019 Budget are helping her get by right now. 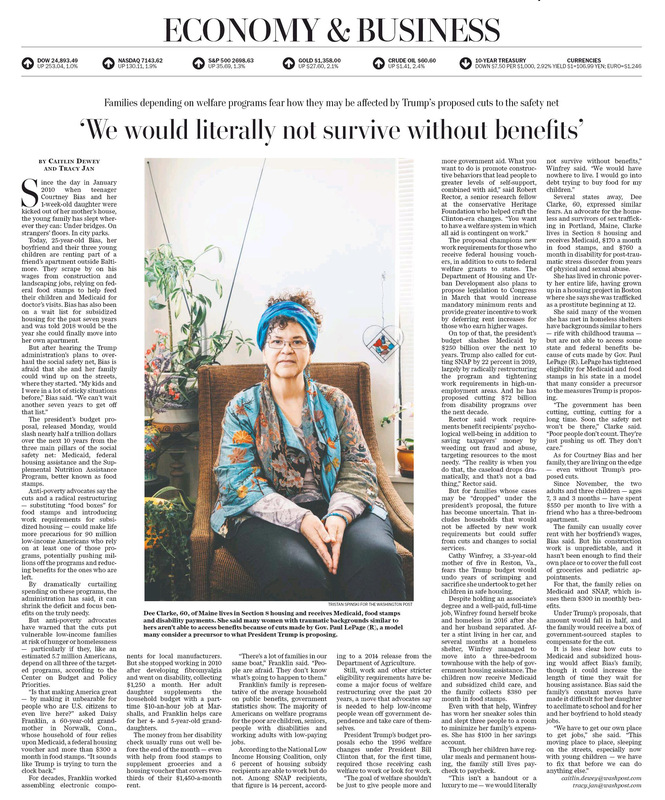 “This isn’t a handout or a luxury to me — we would literally not survive without benefits,” she said. Britepaths' Programs help fill the gap, but we are extremely concerned about how proposed cuts to our social safety net services will affect hard-working families like Cathy's who live very near us. Below is the excerpt of Cathy's interview. "Cathy Winfrey, a 33-year-old mother of five in Reston, Va., fears the Trump budget would undo years of scrimping and sacrifice she undertook to get her children in safe housing. "Despite holding an associate degree and a well-paid, full-time job, Winfrey found herself broke and homeless in 2016 after she and her husband separated. After a stint living in her car, and several months at a homeless shelter, Winfrey managed to move into a three-bedroom townhouse with the help of government housing assistance. The kids now receive Medicaid and subsidized child care, and the family collects $380 per month in food stamps. "Even with that help, Winfrey has worn her sneakers down to the soles and slept three people to a room to minimize her family’s expenses. She has $100 in her savings account. Though her children have regular meals and permanent housing, the family still lives paycheck to paycheck. "'This isn’t a handout or a luxury to me — we would literally not survive without benefits,' Winfrey said. 'We would have nowhere to live. I would go into debt trying to buy food for my children.'"